Guys. Guys. Do you like airships, steampunk, aliens, sky pirates, cults and otherworldly beings? Then probably you should read this book because it’s a lot of fun. Isaveth’s father has just been arrested for a murder she knows he didn’t commit. Determined to seek justice and prove her father’s innocence, she teams up with a wise street urchin and begins unraveling a plot that winds its way through the divide in social classes in her magical city of Tarrenton. The rich have all the magic they could want, while poor folk like Isaveth and her family can barely afford spells for heat and light. The unrest of the common citizens is at its boiling point and the murder pinned on her father will only make matters worse unless she can prove he didn’t do it. -stares open-mouthed into the distance for a moment- Oh! I finally understand the title! Ahem, anyway. Arabella Ashby was born and raised on Mars on her father’s plantation. For seventeen years, she and her brother Michael were tutored by their Martian nanny, Khema, and Arabella often participated in hunting games that her mother considered unladylike. After one such game, Arabella takes a blow to the head that requires stitches and it’s the last straw for her mother. Arabella and her two young sisters are shipped back to Earth in the care of her mother to grow up as true English ladies should. Once there, Arabella is miserable and struggles to bend to the rules society places on ladies of her stature, as well as the heavier gravity. However, the death of her father and a threat against Michael’s life forces Arabella into action and she soon finds herself disguised as a boy and enlisted as a crew member aboard a Martian airship, racing against the clock to get home and save her brother. This book checks a lot of boxes for me, so I assumed I was going to enjoy it (spoiler: I did!) We’ve got Regency England (check), steampunk (check), space travel (check) and one tough chick that can’t stand to be forced into societal and gender roles (check). I received this book for free from Net Galley in exchange for an honest review. This does not affect my opinion of the book or the content of my review. All opinions in this post are my own. 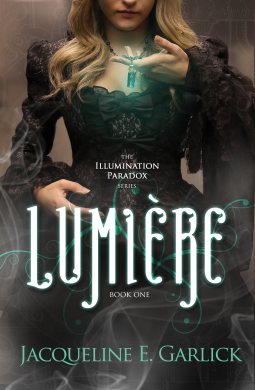 From Amazon: Seventeen-year-old Eyelet Elsworth has only one hope left: finding her late father’s most prized invention, the Illuminator. It’s been missing since the day of the mysterious flash—a day that saw the sun wiped out forever over England. But living in darkness is nothing new to Eyelet. She’s hidden her secret affliction all of her life—a life that would be in danger if superstitious townspeople ever guessed the truth. And after her mother is accused and executed for a crime that she didn’t commit, the now-orphaned Eyelet has no choice but to track down the machine that was created with the sole purpose of being her cure. Alone and on the run, she finally discovers the Illuminator—only to see a young man hauling it off. Determined to follow the thief and recover the machine, she ventures into the deepest, darkest, most dangerous part of her twisted world. From Amazon: In the early days of the Civil War, rumors of gold in the frozen Klondike brought hordes of newcomers to the Pacific Northwest. Anxious to compete, Russian prospectors commissioned inventor Leviticus Blue to create a great machine that could mine through Alaska’s ice. Thus was Dr. Blue’s Incredible Bone-Shaking Drill Engine born. But on its first test run the Boneshaker went terribly awry, destroying several blocks of downtown Seattle and unearthing a subterranean vein of blight gas that turned anyone who breathed it into the living dead. Now it is sixteen years later, and a wall has been built to enclose the devastated and toxic city. Just beyond it lives Blue’s widow, Briar Wilkes. Life is hard with a ruined reputation and a teenaged boy to support, but she and Ezekiel are managing. Until Ezekiel undertakes a secret crusade to rewrite history. His quest will take him under the wall and into a city teeming with ravenous undead, air pirates, criminal overlords, and heavily armed refugees. And only Briar can bring him out alive.